We all remember so much about extra-time in the 1966 World Cup final. But no Englishman at the time hoped it would happen. With the seconds ticking away and England leading 2-1, Jack Charlton gave away a free-kick on the edge of the box. The ball ricocheted into the path of Wolfgang Weber, who pounced from close range to fire past Gordon Banks. 2-2. Seconds later the final whistle sounded and England needed to lift themselves for another 30 minutes. Today we’ll play the hypothetical game and consider what would have happened if West Germany had not snatched a (largely avoidable) equaliser in the dying seconds of normal time. Let’s be honest, how often do we ever remember linesman (or referee’s assistants in today’s money)? Barely ever and that would have been the case in the 1966 final for Tofiq Bahramov had the match ended in normal time. But as extra-time progressed, he would become synonymous with one of the most controversial moments in World Cup history. Nearly 50 years on the arguments still reign about whether Geoff Hurst’s shot crossed the line, but Bahramov was adamant it had gone in. The man from Azerbaijan would forever be remembered as the ‘Russian linesman’. Martin Peters was seconds away from the most meteoric of rapid rises. Think Paul Gascoigne, Paul Parker and David Platt all emerging late in the day to shine for England at Italia ’90 and multiply it several times. Uncapped until May 1966, Peters fought his way into Ramsey’s ‘wingless wonders’ and would put England 2-1 up in the closing stages of the final. It really should have been the winner. And if it had have been, one suspects the course of history may have panned out differently for England’s two goalscorers that July afternoon. He and West Ham United team-mate Geoff Hurst would have both scored one each, but Peters would be forever remembered for getting the winner. And the goal he scored would probably be played over and over again (Ronnie Radford eat your heart out!) and stand out as a truly iconic moment – the instant England won the World Cup (see above image). One suspects more doors down the years would have opened for Peters rather than Hurst and it could have led to him being the one to receive a knighthood. But scoring in a World Cup final isn’t a bad thing to have on your CV anyway! A combination of it being such a special moment for English football and Wolstenholme’s words fitting perfectly made the commentary famous and ensured he would never be forgotten. And Wolstenholme could be grateful for extra-time for that, more so than ITV counterpart Hugh Johns whose commentary that afternoon (“he has, he has”) would never be viewed with the same affection or lasting legacy. And England duly did. Going into extra-time served to enhance Ramsey’s reputation as a motivator of his players, doing so in the most important moment of his managerial career. So how would it have been remembered? 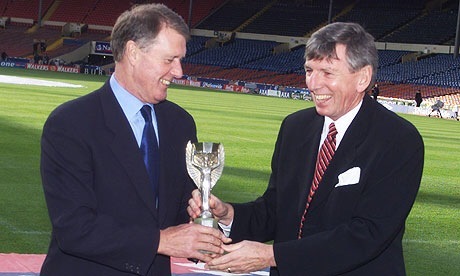 Jack Charlton claimed in this interview in 2006 that but for the West German equaliser and the ensuing drama, then the 1966 final “would probably have been forgotten”. I’m not sure I totally agree with Big Jack on that, but I’d certainly go along with the general gist of what I think he means – that the final became far more memorable due to the events in extra-time than if it had been settled in 90 minutes. I don’t think it would have made any difference in the immediate aftermath. The newspapers the next day would have still had front page headlines such as ‘England – Champions of the World’ with Bobby Moore proudly holding the Jules Rimet Trophy aloft. I also don’t think there would be any less obsession today with the fact England won the World Cup in 1966, given the subsequent failings. But I can’t help feeling that had England simply dealt with that free-kick in the final seconds of normal time, there wouldn’t be quite the same emphasis on the final when looking back at 1966. It would be seen as a brave comeback from England to win 2-1 and, as said earlier, the winner by Peters would probably be the most famous moment in the history of our national game. But there would have been far fewer talking points from that afternoon. Though the final would always stand out as England’s greatest day and be replayed fairly frequently, I suspect the tournament as a whole (and especially England’s tense knockout matches with Argentina and Portugal) would not be as overlooked as it often is. England, Football, Geoff Hurst, Kenneth Wolstenholme, Martin Peters, West Germany, What if...? Excellent questions and different perspectives. The drama came with extra-time. It’s the “what ifs” in 1990, 1996 and 1998 I always think about! 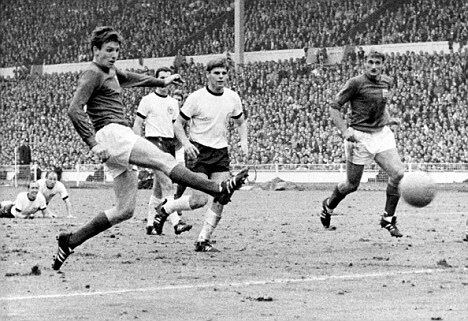 England Memories What if… West Germany hadn’t equalised in 1966?